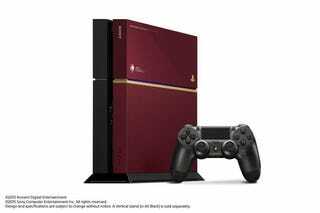 I would call this the most gorgeous PlayStation 4 released so far, but I prefer the 20th Anniversary model. That being said, this looks nice. Real nice. Konami has announced a special Metal Gear Solid V: The Phantom Pain PlayStation 4. The color combination is patterned after Snake's bionic arm. Pretty slick! The console—and controller—both have emblazoned Diamond Dogs logos. According to Game Watch Impress, this doesn't have pricing or a release date yet. But expect it this fall in Japan when MGSV: TPP comes out. No word yet on an international release.